An Apple patent filing discovered on Thursday describes a system in which a primary iOS device, such as an iPhone, remotely controls multiple secondary devices, which can also be iPhones, as slave flashes for the first handset's on-board camera. 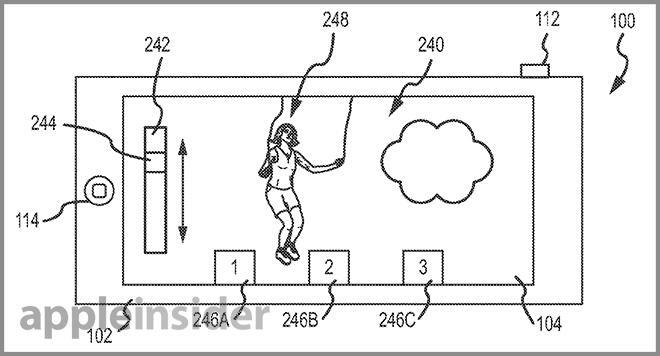 Filed with the U.S. Patent and Trademark Office as an "Illumination system," Apple's invention proposes that a number of devices, like iPhones, iPads, iPods or other mobile products, can act as remotely-controlled strobe lights for a primary camera. 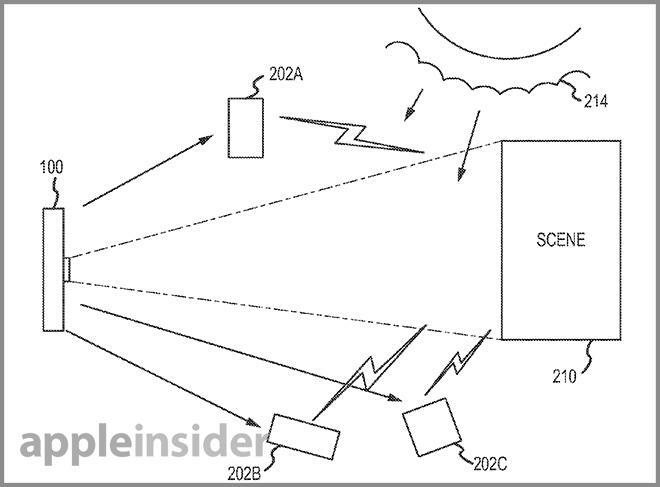 The idea of connecting multiple iOS devices belonging to different people, the patent application can be considered a "social camera flash" system, perhaps useful in impromptu photo shoots that require more than one source of lighting. The patent application notes the primary device can be either a dedicated camera or a handset with image capture capabilities, while the slave units can be the same product or any other suitable device with lighting components. In some cases, the remote units can be dedicated flash components built into the primary device's charger, charing cable or other component a user is likely to have handy. Examples of cable-mounted flash (left) and charger flash (right). In practice, the primary device sets up a master-slave connection with the one or more secondary devices, takes a test image to determine the illumination requirements of a scene, and sends a control signal to the secondary devices pertaining to position, intensity and timing. Similar systems are used in professional photography, but those rigs use dedicated strobes with wired or wireless connections. Unlike most traditional master-slave setups, however, Apple's invention allows for the primary device to give instructions to the user regarding lighting placement. Likewise, if other people are holding the secondary handsets, the primary device can send over instructions directly to those users, positioning them remotely. As one example, a display associated with (or incorporated into) a secondary device may display text instructing a person holding that device to move in a particular direction, for a particular distance, to angle or move the device in a certain manner, and so forth. In addition, the secondary devices can relay positioning information back to the primary capture device so it can automatically adjust flash timing and intensity. One key aspect of the invention is the connection protocol used to transfer remote flash signals as well as instructions between the master and slave units. Current systems may inadvertently discharge in response to light input  a common remote strobe function referred to as "optical slave"  from another camera or system. Instead, Apple proposes the use of wireless technology like Bluetooth or Wi-Fi, thus protecting against premature flashes. As for image analysis, the patent claims a graphical user interface can be used to preview a test shot and offer granular control over the secondary devices acting as slave flashes. In an alternative method, the primary device can display user-selectable scene options which, when selected, will automatically change slave units' flash fire intensity, timing or provide instructions for repositioning. The filing goes on to explain further embodiments of scene and background correction based on test shot analysis. Invention GUI with manual controls. Apple's remote flash patent application was first filed in November 2011 and credits Richard L. Baer as its inventor.